Every year, the HEAL Cities & Towns Campaign provides technical assistance to member municipalities across Colorado. 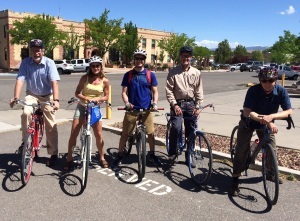 In 2016, the Campaign had the opportunity to provide Montrose, Edgewater, and Leadville with technical assistance to formulate recommendations to improve walking and biking in their communities. The City of Montrose requested assistance to improve active transportation options among seven specific areas within the community. The Technical Assistance (TA) team conducted two site visits in collaboration with several city staff and local stakeholders to bike and walk the areas of interest, assess existing conditions, and develop a set of recommendations tailored to the unique challenges and opportunities at hand. After four months of collaboration and analysis, the TA team arrived at a set of 17 recommendations including neighborhood greenways (bicycle boulevards), improved wayfinding on an off-street trail that transects the community, and right-sizing lane widths on a CDOT roadway abutting a primary access point to a river trail. City staff and local stakeholders, including members of the Montrose Area Bicycle Alliance will work together in the coming months to prioritize the recommendations and explore how and when they could be funded through municipal sources and outside grants. The City of Edgewater requested assistance with development of an active transportation plan that would identify key community destinations and provide recommendations to improve safety on routes to and from them. Improving connectivity and creating a better network for walking and biking was a primary goal. The TA team conducted three site visits in Edgewater and coupled with input from local stakeholders including HEALthy Edgewater, arrived at a set of 10 recommendations. Focused on both on-street and off-street facilities, the recommendations are heavily focused on providing low-stress facilities to and from two local elementary schools, increasing the visibility and directional signage on a shared use trail in the southern portion of the community, and reorganizing a couple of key street segments to better distinguish bicycle lanes, motorized lanes, and curbside parking areas. Going forward, the City of Edgewater staff and members of HEALThy Edgewater will convene to prioritize the recommendations and discuss estimated costs, phasing, and implementation. The City of Leadville requested assistance with the development of a Complete Streets policy and guidance on working with community stakeholders to navigate a wide range of concerns and interests related to this topic. 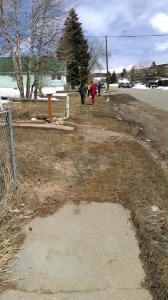 As revealed through an all-day site visit early in the project with active living advocates, key staff members, and elected officials, the poor condition of infrastructure in several parts of the community presents a barrier to walking or bicycling regardless of age or ability. The underlying question of this project was how could annual street improvement and utility projects be leveraged as opportunities to make Leadville a more pedestrian and bicycle friendly community not only for its existing residents but its thousands of visitors each year? To help address this question, the TA team conducted a half–day workshop to further explore what a complete streets policy could mean across a variety of agencies and importantly, how could it move beyond policy into actual improvements to roadways, sidewalks, and trail connections. The final narrative from the workshop covered, opportunities, assets, barriers and concerns and can be used as tool in further advancing the community conversation around policy development and adoption.